For over twenty years Jon J. Murakami’s (b. 1970) comic strips, books and popular line of greeting cards showcased as well as poked fun at Hawai‘i’s “local” culture. Like many children of his generation Murakami was influenced by the storylines and action of tokusatsu shows. 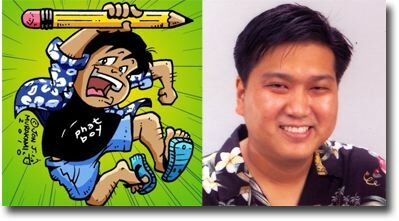 Combined with a healthy dose of “funnies” in the Sunday newspaper, Murakami’s comic strips featured a unique brand of humor. Told over the course of six issues, Gordon Rider illustrates the adventures of Hawai`i’s worst superhero. As a parody of the tokusatsu Kamen Rider, Gordon Rider speaks directly to tokusatsu fans pointing out the often formulaic storylines and cheesy special effects that once enthralled them. While inside jokes are featured prominently, a younger generation unfamiliar with these references can appreciate Gordon Rider for its bumbling yet endearing “hero,” and slapstick and ironic humor.